It is apropos that the newly-renovated Meow Wolf Art Complex was born out of a partnership between Meow Wolf, an arts and entertainment production company, and well-known “Game of Thrones,” author George R.R. Martin. The old Silva Lanes bowling alley had been on the market for six years, with only minimal interest. Meow Wolf CEO Vince Kadlubek worked for George R.R. Martin at Martin’s Jean Cocteau Theater and thought Martin might be interested in the prospect of owning the building. Over the course of four months, Martin and Meow Wolf hammered out the details. The building was purchased and almost immediately began a transformation. The front of the building was adorned with larger-than-life sculptures loudly announcing Meow Wolf’s presence. 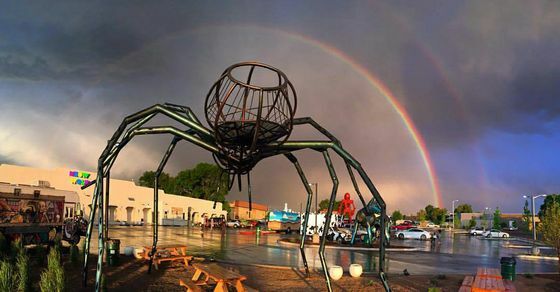 Larger-than-life sculptures greet visitors in the Meow Wolf parking lot. The centerpiece of Meow Wolf’s Art Complex, is a recently opened, 20,000 square-foot permanent attraction called the “House of Eternal Return”— an explorable wonderland built for audiences of all ages. Built on the premise, “Something has happened inside a mysterious Victorian house that has dissolved the nature of time and space.” Each visitor is invited to choose their own path through the exhibition—walking, climbing, and crawling through “an imaginative multiverse of unexpected environments.” Visitors are encouraged to figure out what happened to the family from Mendocino, Calif. living in the Victorian house in the midst of a dimensional rift. The scope of this project is made possible by a mastermind of many artists. Adding to this unique experience is artwork and talent by UNM College of Fine Arts (CFA) alumni and students. UNM alumnus Russell Bauer's “Livestock BETA” on permanent display in Meow Wolf. 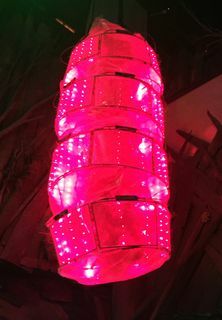 The hanging chrysalis-like pod has a three-point computer vision system that allows the sculpture to track movement around it and respond to changes in its environment. During the “Eat Me” exhibition, food grown within the three Livestock pods was harvested and fed to viewers through a series of performances. UNM alumna Kristen Woods spearheaded the performance aspect of “Eat Me,” which included aerialists on silks serving the food grown from the BETA. Larry Bob Phillips, another UNM CFA MFA graduate, painted the murals in the entrance and the eyeballs in the back hall lining the permanent exhibition. But there are multiple people running the project’s day-to-day operations behind-the-scenes. One such person is UNM student Chris Clavio, who took a sabbatical from studying in the Electronic Arts program to pursue fulltime work with Meow Wolf. Chris Clavio, who studied in UNM's College of Fine Arts Electronic Arts program, working on the laser harp at Meow Wolf. Clavio lead the team that installed most of the low voltage infrastructure systems. Clavio credits Meow Wolf with breaking down traditional barriers for artists. The exhibit is comprised of many different works of art created by professional and amateur artists. Working with the daily tech team at Meow Wolf is only part of Clavio’s contribution to the project. During its installation, he helped design many of the low voltage infrastructure systems and lead the team that installed most of them. This includes all of the LED lighting in the show, the network backbone and surveillance system. 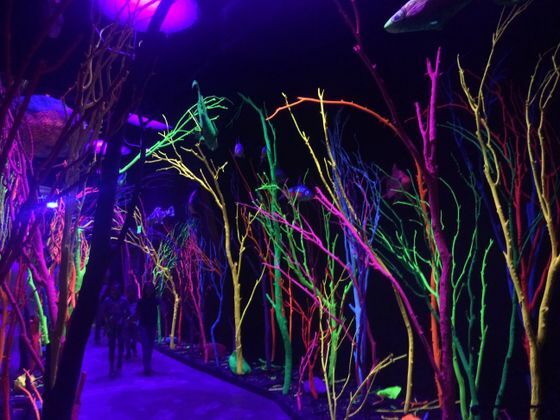 Initially, Meow Wolf expected around 100,000 visitors annually to the “House of Eternal Return.” Having only been open since March, the exhibit has already surpassed this attendance expectation thus solidifying itself as one of the premiere family attractions for both locals and tourists.